You are experiencing a wonderful amount of movement forward at this time, and you are handling the changes you’ve been experiencing within you very well. 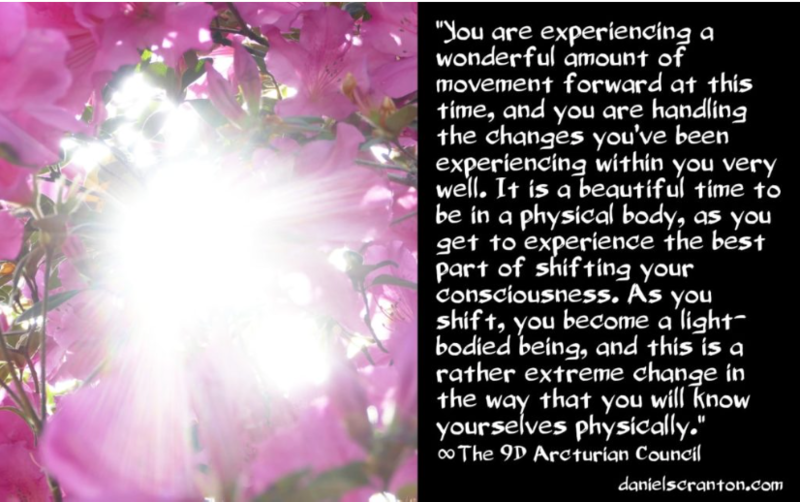 It is a beautiful time to be in a physical body, as you get to experience the best part of shifting your consciousness. As you shift, you become a light-bodied being, and this is a rather extreme change in the way that you will know yourselves physically. It is exciting to say the least, but there’s also a familiarity that you have with the current physical vehicle, and there is something very comfortable in the familiar. So the transition will always entail a bit of letting go of what you have known, and the more attached you are to your physicality, the harder the transition will be. The more you can see yourselves as consciousness that is having a physical experience, the easier the transition will be. You can love your physical bodies just as they are, and also not be attached to them, just as you could walk into a luxurious home and fall completely in love with it. And then you could go next door to another luxurious home and fall equally in love with that one. You would not feel any attachment to the first home that you explored in this scenario. And we know that some of you who are receiving this transmission are thinking, ‘I am ready to go, and I have no attachment whatsoever to this physical form.’ And that is all well and good, but until you experience a physical transformation, you cannot know exactly how attached you are. This is why meditation is so important, and this is why we’re always telling you to go within. To know yourselves as more than just your physical form is going to make the shift to the fifth dimension so much more pleasant and enjoyable, and that is the experience we know you all want.